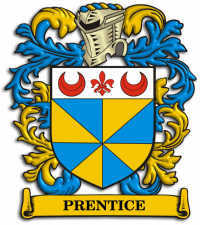 If you have any other images or descriptions of coats of arms used by Prentices, please pass them on to us! "With best wishes for the New Year, John Warwick"
Other notes and papers found in this book were dated 1895 thru 1914. The late Ezra P. Prentice, of "Mt. Hope," Albany, while in England, procured from the Herald Office, London, the Prentice arms as he was assured as represented on p. 249 of the first edition, and reproduced in this edition a gyron of eight ar. and or. on a chief ar. A fleur-de-lis between two crescents gules; crest, an eagle displayed, in his dexter claw a dagger, in his sinister claw a pistol. Motto: Droit en avant. Burke has the same. These arms are used by the Prentice family of Leeds, Stowmarket, etc. Prentys, Norfolk County, England, chev. or. and sa. Three greyhounds courant, counter changed, collared, crest, a demi-greyhound rampant or. collared, ringed and lined sa. ; the line coiled in a knot at the ends. 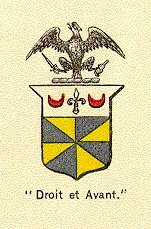 Nathaniel Appleton Prentiss, Esq., 59 Liberty Street, New York City, has a stamp made of these arms for note paper and the crest with this motto under the latter, Droit et en avant, which he thinks more appropriate. This could not be used for this book. He says these arms were worked on a satin sampler bv his great-aunt Elizabeth, dau. of Rev. Joshua Prentiss, of Holliston, Mass., which is now owned by his aunt, Mrs. Henry Prentiss, No. 16 Bulfinch Street, Boston. This sampler was mentioned in the first edition. It was formerly owned by his father, Nathaniel Appleton Prentiss, of South Andover, Mass. Burke has these arms. Prentis, Scotland, ar. a chev. between three greyhounds courant sa. Crest, a leopard's face gu., spotted or. (per Burke), who also gives Prentisse, az a chev. between three roses ar. Frederick Prentice, Esq., sheriff of Norwich, Ct., said his father had a coat-of-arms, but it disappeared. Mrs. Stetson, a granddaughter of Rev. Thomas Prentice of Charlestown, Mass., had in Dorchester, Mass., the Prentice and Kettell coat-of-arms united, as named on p. 250 of first edition (painted by Doyle, in Boston, who painted them to suit). On the left half of the shield, divided by a perpendicular line, is the Kettell arms, viz., upper and lower part sa. chev. with three female figures in white kneeling. The Prentiss half has the upper and lower part of the shield ar., divided by a bar gu., two Greyhounds in the upper part and one in the lower part, all sa., in the bar a demi-lion rampant az. Caleb Prentiss, of Danvers, Mass., had a coat-of-arms (probably one by Doyle) and said to be Prentiss. 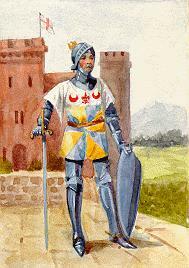 Crest, a huntsman with a gun by his side and a greyhound, sa., below him a helmet, visor closed, shield ar., with a chev. gu., a demi-lion rampatit az. in the middle of the chev. ; above the lion, a greyhound on the left and one on the right side and one greyhound on the lower part of the shield below the chev. ; the greyhounds sa. Motto below the shield, "By the name of Prentiss." This is said once to have belonged to Elizabeth, dau. of Rev. Joshua Prentiss, of Holliston, Mass. A coat-of-arms worked on satin and framed was owned by Nathaniel Appleton Prentiss, of South Andover, Mass. Crest, a greyhound couchant; shield three lozenges, two upper sa., lower one ar., three greyhounds couchant in the shield (two above and one below) sa. 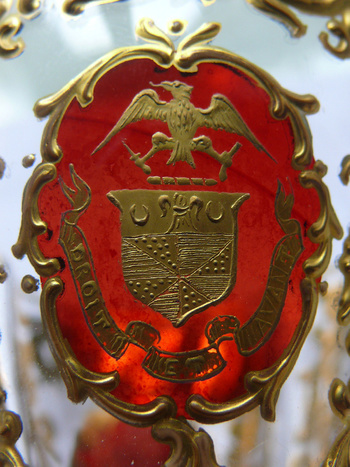 This is an example of the Ezra P. Prentice coat-of-arms used on a goblet. Further information and discussion is available at the Collectors Weekly website: quatrefoil goblet with the coat of arms of the ezra p prentice family. Not sure of the source for this rendition. Will provide details when available. Looks to match the description of arms owned by Nathaniel Appleton Prentiss (above). 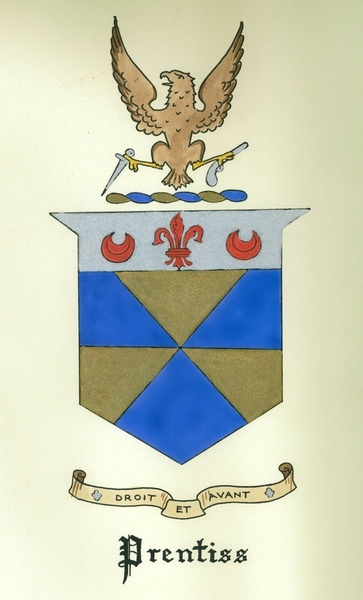 A variation on the Ezra P. Prentice arms found in Genealogical Histories of Prentiss and Allied Families, edited by Ruth Lawrence in 1930. A wonderful rendition of the Prentice arms from Designs of Wonder! Droit et Avant - A direct translation from French to English is "Right and Before" .. however, I've seen it translated as "straight ahead" and "straight forward" also. Other translations are welcome!